"The power in the Number Talks comes from inspiring each child to think and make sense of the mathematics they are presented. They are never trying to figure out what the teacher wants. Rather they are totally engaged in their own sense making process." AUTHOR'S NOTE: After reading this piece, check out the companion piece "Digit Detectives: Student-Created Number Talks," which details how I turned over ownership of number talks to my students. This year in math, we have started each day with a number talk. I first learned about number talks last year when I was taking a Stanford online course about building mathematical mindsets with Jo Boaler and Carol Dweck. At their core, number talks are 10-15 minute experiences where students are presented with a math prompt and have to work out various solutions using only mental math. The teacher acts as a facilitator, never agreeing or disagreeing with any answers. To do number talks successfully, there are some norms we established. When a student has a solution to the problem, they place a thumb on their chest. If they have more than one answer, they put up additional fingers. This is done rather than raising hands so other students who take a little more time to answer don't feel overwhelmed when they see lots of hands in the air. We also have signals for agreeing and disagreeing. If students agree with each other, they give the "hang ten/surfer dude" signal. This provides affirmation to the student who answered and shows we are a community of learners. On the other hand, if a student disagrees with an answer, they raise their hand. They are welcome to disagree at any point, as long as they do so respectfully and support their disagreement. In addition to the norms, we also have a variety of "frameworks" we use for number talks. 1. Which One Doesn't Belong: These are mostly based on the examples from wodb.ca. In this format, students are presented with four images. They may be numbers, objects, shapes, or anything else. Of the four, they need to decide which one does not belong and support their answers. 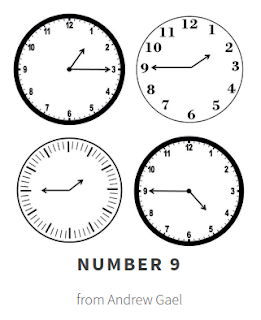 In the example to the right, students could say the bottom left doesn't belong because it has no numbers, the top right doesn't belong because it has no individual minute lines, or the bottom right is the outlier because it is not in the one o'clock range. We did this particular one in the ninth day of school. One student who had not been participating in number talks regularly put his thumb up. When I called on him, he said, "The top left one doesn't belong because it is an acute angle and the rest are bigger." We had never touched on angles yet in the year, and it's a fifth grade standard. It floored me to see a usually disengaged child come up with a more advanced term. The other thing I like about WODB is that there are no right answers. As long as students can support their case, it's a valid thought. 2. Balance the Scale: In this scenario, I draw a rudimentary seesaw on the board. On one side, I put a box with a number in it and two empty boxes on the other side. If you can't see where this is going, students have to balance the scale by putting things in the empty boxes to equal the value of the filled box. As we progress, I add more filled boxes on the right and empty ones on the left to increase the level of challenge. I tell the students they can use any operation and whole numbers, decimals, or fractions (even though we haven't started operations with decimals or fractions.) Students took risks and tried adding and subtracting decimals and fractions. Some were accurate, others were inaccurate but were caught by peers, and others were incorrect but no one (aside from me) caught it. However, it is important to me not to correct them because the number talk is not about being right or wrong. 3. I Notice/I Wonder: I don't have any picture of this particular one, but we did a number of them during our graphing unit. When using these with graphs, I would take two days to do each one. On the first day, I would show the students a graph, but axis labels, scale, and title would be covered. To the right, there was a T-Chart with "I Notice" and "I Wonder." Their Notices were things that they observed and Wonders were questions they had. On the first day, they usually Noticed things such as the varying bar heights, the labels were missing, and the trends. They Wondered about the labels and why different trends were happening. Many made predictions for what it could be. On the second day, I fully uncovered the graph. Inevitably, nearly all of their Wonders from the prior day became Notices. I didn't show them this until we were all done, however. They noticed even more and then were able to articulate stronger Wonders now that they had all the information. 4. Addition/Subtraction Strategies: Apparently I dropped the ball on taking pictures of this style, too. I also need a better name for it. More or less, I project an addition or subtraction problem on the board. Students solve it using a variety of strategies, including the traditional algorithm, expanding into each place value, and rounding to different values and adding/subtracting back in at the end. This is done all in their heads as I write what they said. I like it because it helps them to develop mental math and strong computation. I am excited to try it with multiplication and division and will start those soon. 5. Mystery Number: This one is by far the favorite one for students and me. I give the students clues for numbers one at a time. For example, it may start with "I am a six digit number." Students then generate a few options for this clue. We reveal the next clue ("My tenths and my tens are the same digit".) We go back to the original guesses and eliminate any options that no longer work. In the beginning, students only were thinking whole numbers so usually they would all be eliminated. They've since learned. I keep revealing more clues until the final clue is revealed. Each time, we will eliminate or carry over old guesses. At the end, sometimes I have prompted them into one correct answer, but often I leave it to multiple numbers would work. This one really grows their brain, especially when they have six clues to use. They'll catch themselves before anyone can disagree, by saying something like "Oh wait, my tenths isn't the same as my tens. Change them both to a 3." Another framework I want to try is "Would You Rather." I just saw this idea on Twitter the other day. It was something along the lines of "Would you rather take your little brother Trick-or-Treating for a flat $75 payment or $1 for every four houses." Students would then craft arguments based on their choice. The number talk doesn't always have to explicitly connect to the lessons for the week. It's more about getting their minds into a mathematical mindset and developing strong number sense. It can be used to review old skills, reinforce current, or pre-assess upcoming topics. The students enjoy them and it's incredible to see the connections they make. How could you use a number talk with your grade level? How could this concept be adapted to other subject areas?